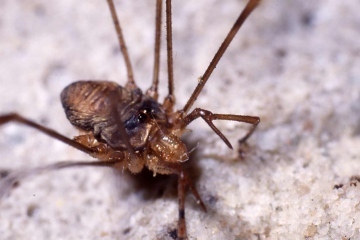 The Fork-palped harvestman Dicranopalpus ramosus agg. is thought to have originated in the Mediterranean region. It was first recorded in the UK in 1957 in Bournemouth. Since then it has spread steadily northwards, and continues to do so. It reached Scotland in 2000. 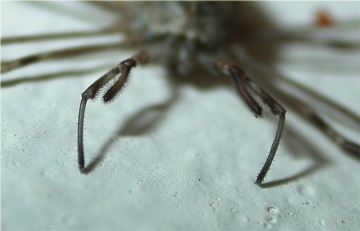 The body of adults is 4 – 6 mm in length with long legs and distinctive forked pedipalps formed by an apophysis (projection), almost as long as the tibia, emanating from the patella. They have a distinctive resting position, with legs held straight out to either side, at right angles to the body. In adult females the apophysis is tubular, rounded at the distal end and covered with fine setae, whereas those of adult males are thinner with a more pointed end and hairless. 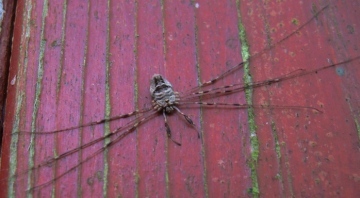 Adult Dicranopalpus ramosus are found from late summer into winter. They occur in bushes and trees, often in habitats associated with man, and are easily collected by beating or sweeping suitable areas of vegetation. However, they are perhaps most obvious when resting on walls and fences; their forked palps and characteristic resting position make them unmistakable. You will need to register and be logged-on to do this.